Two novelists share imaginative works that take the reader on a road trip to faraway places. Yann Martel, author of the international bestseller Life of Pi, will read from The High Mountains of Portugal, which explores the interconnected lives of individuals caught up in ancient Portuguese mysteries. Additionally, Claudia Casper will read from The Mercy Journals, an unsettling novel that uses a sparse, dystopic landscape to explore questions of morality and forgiveness. Yann Martel discusses Beatrice and Virgil. Yann Martel discusses Darwin’s Bastards: Astounding Tales from Tomorrow. Yann Martel reads from Beatrice and Virgil. Yann Martel lives in Canada. Yann Martel's book Beatrice and Virgil was available from LibraryThing Early Reviewers. Yann Martel's book Life of Pi was available from LibraryThing Early Reviewers. 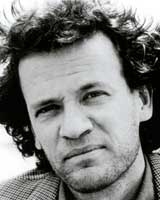 Yann Martel is currently considered a "single author." If one or more works are by a distinct, homonymous authors, go ahead and split the author. Yann Martel is composed of 17 names. You can examine and separate out names.